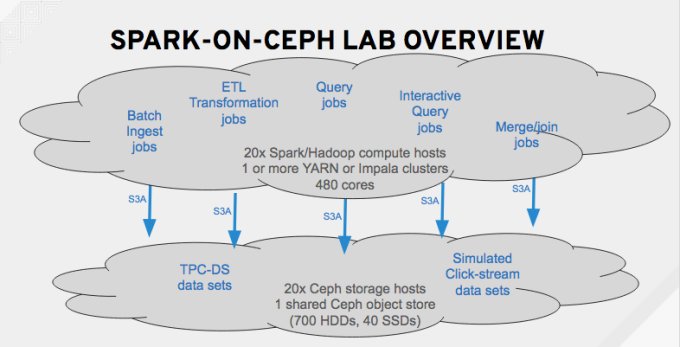 A couple years ago, a few big companies began to run Spark and Hadoop analytics clusters using shared Ceph object storage to augment and/or replace HDFS. We set out to find out why they were doing it and how it performs. For those wanting more depth, we’ll cross-link to a separate architect-level blog series providing detailed descriptions, test data, and configuration scenarios. 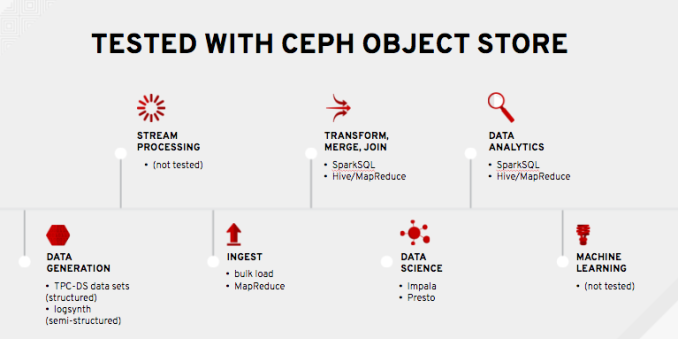 Our early adopter customers are ingesting, querying, and transforming data directly to and from a shared Ceph object store. In other words, target data locations for their analytics jobs are something like “s3://bucket-name/path-to-file-in-bucket” within Ceph, instead of something like “hdfs:///path-to-file”. Direct access to S3-compatible object stores via analytics tools like Spark, Hive, and Impala is made possible via the Hadoop S3A client. In addition to running simplistic tests like TestDFSIO, we wanted to run analytics jobs which were representative of real-world workloads. To do that, we based our tests on the TPC-DS benchmark for ingest, transformation, and query jobs. TPC-DS generates synthetic data sets and provides a set of sample queries intended to model the analytics environment of a large retail company with sales operations from stores, catalogs, and the web. Its schema has 10s of tables, with billions of records in some tables. It defines 99 pre-configured queries, from which we selected the 54 most IO-intensive for out tests. With partners in industry, we also supplemented the TPC-DS data set with simulated click-stream logs, 10x larger than the TPC-DS data set size, and added SparkSQL jobs to join these logs with TPC-DS web sales data. Yes. 1000s of analytics jobs described above completed successfully. SparkSQL, Hive, MapReduce, and Impala jobs all using the S3A client to read and write data directly to a shared Ceph object store. The related architect-level blog series will document detailed lessons learned and configuration techniques. In the final episode of this blog series, we’ll get to the punch line – what was the performance compared to traditional HDFS? Stay tuned for part 3 of this series…. For any questions on Red Hat Linux Enterprise Solutions, or any other Enterprise Consulting Requests- Please Give us A call at (973)343-5479.